Yeah, I know, this isn’t a food blog. But not only did I make some delightful cookies this afternoon from a recipe passed on by Sacraparental regular Daina, and not only are they healthy(ish) and made of enough weird ingredients to deserve a blog post, but Angela, food photographer extraordinaire from The Sponge, was there when they came out of the oven! So I couldn’t help thrusting my point-and-shoot camera at her and telling her to be my food stylist and photographer so I could blog about these treats. Lucky me! Lucky all of us! Daina brought these to my attention in connection with our brilliant thread on eating more legumes. Or rather, that brilliant thread on the insane chocolate bean cake (and some other more prosaic uses of legumes). And like that cake, this is ninja baking at its finest. Sneakily full of good, nutrient-dense ingredients, and based not on any kind of flour but on, wait for it, chickpeas. Some of my friends find butter-free baking to taste a bit disappointing. I think the combo of chickpeas and nuts might be the answer. These taste, frankly, buttery. They’re really very good. 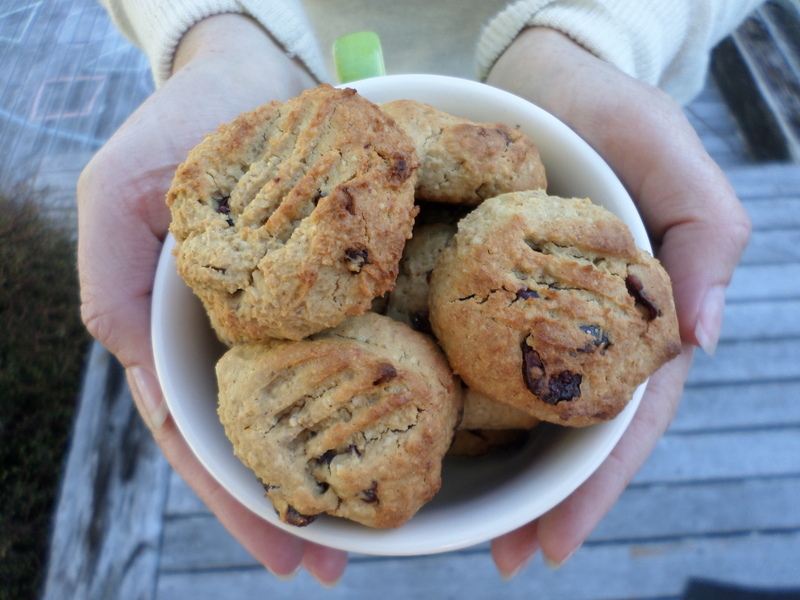 My cookies are based on this recipe for Chickpea Chocolate Chip Cookies from Lauren Brimley, but I’ve made quite a few changes, so I’m just giving you my version below. Do head to see hers as well (especially because they have chocolate in them!). I’m really not a food blogger, so I should add the disclaimer that I made these for the first time this afternoon, and was a bit slapdash with measuring, but it seems like very forgiving recipe. Daina also made changes when she did it and had great success. Put the oven on to 180C (350F). 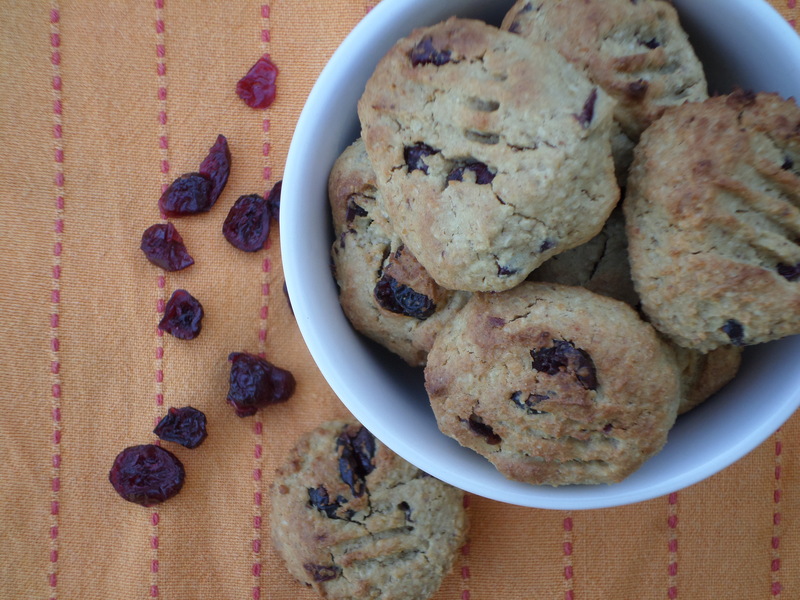 Chuck everything except the cranberries in a food processor and whizz until it’s a smooth cookie dough mix. Add more rolled oats if it’s too sloppy, but sticky is fine. Add the cranberries (or whatever else) and mix in by hand. With wet hands, form the dough into little balls and flatten with a fork. They don’t really spread, so you can cram quite a few onto baking sheets. I filled two sheets. Bake at 180C (350F) for 12 minutes (or until they’re the colour you like). Longer if you like them crunchy. Made 40 small cookies for me. Peanut-free (but obviously there are other nuts here, and you could use any nuts or seeds at all). The recipe would work fine with sunflower-seed butter instead, I would expect. High in both protein and delicousness! Thanks Lauren, Angela and Daina! 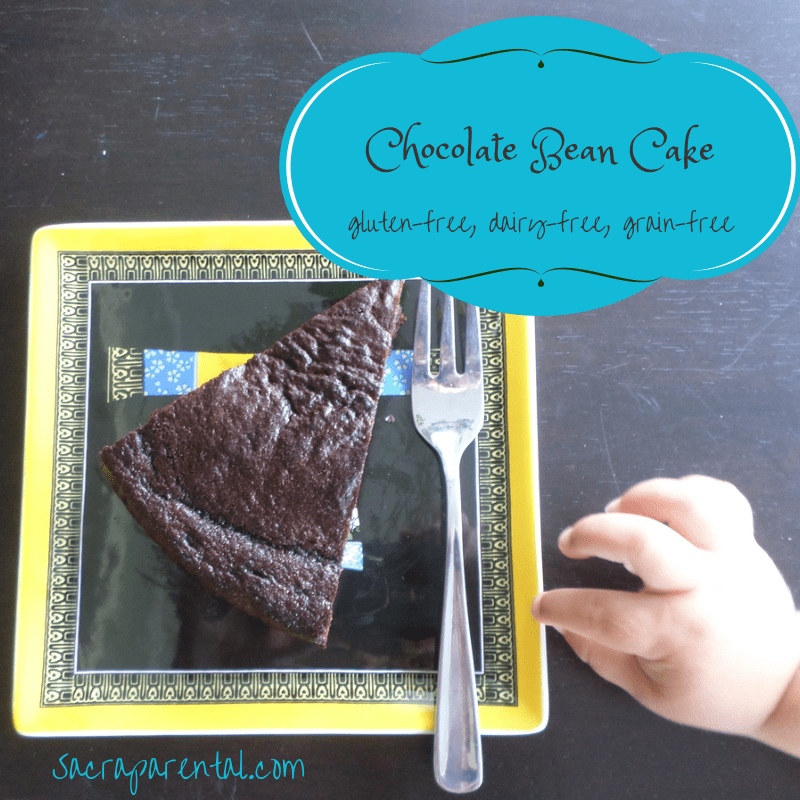 For the astonishing chocolate bean cake (no flour, no dairy, no grains – based on beans!) and other ideas for cooking with legumes, head to the Sacraparental New Year’s Guide to Legumes. Not only does Angela have a brilliant website that includes amazing food and beautiful photographs, you can now buy some of them at her Etsy shop. Fantastic for gifts. And for more Sacraparental goodness, you can follow me on Facebook and Pinterest. Lots of good stuff coming up! 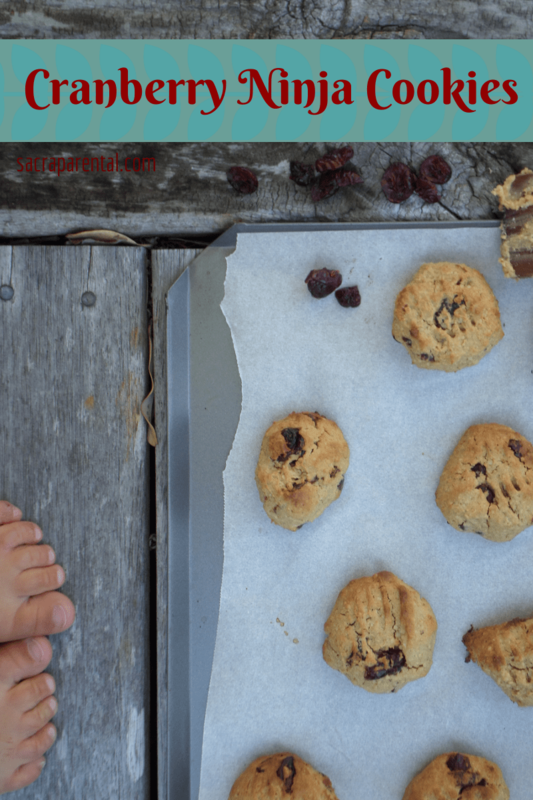 Chocolate and cranberry ninja cookies: tick! I added 1/3 C cocoa, 2t vanilla, and should have reduced the rolled oats, but instead had to add a bit of water. Plus chunks of Trade Aid dark chocolate for my half-batch. Anyway, what a winner of a recipe. Have you made it yet? Ha! Love all those substitutions! Glad to hear of the option for oats – there was someone on the Allergy Support Facebook page who couldn’t eat oats (or, you know, much else ). I wondered about tahini instead of nuts – is pumpkin seed butter better? Tahini is quite bitter, I don’t know how it would taste. Also apparently people with nut allergies are often allergic to sesame seeds too. We just had pumpkin seed butter in the house…. I made these again last night for the first time in a year (I haven’t been eating nuts). Really delicious, and this is SUCH a forgiving recipe.